Mother always said that if you couldn’t say something nice about someone or something don’t say anything, but I didn’t always take mother’s advice. “While We’re Young” took 93 minutes of my life that I will never get back! It immediately goes to the top of my list of worst films of 2015, possibly of the last decade! In case you didn’t know it all guys in their twenties are scam artists, dishonest and unethical while all men in their forties are new fathers and/or are losers while all old men are intellectuals, celebrated, authoritative, honest and believes in the truth. The movie is categorized as a comedy and, yet, there is not one laugh in the movie. Do you find 15 minutes of people vomiting funny? How about people on a bad ‘trip’? I will spare the actors except I will say that after seeing her in 5-6 movies I will avoid seeing Amanda Seyfried in future ones and after the last 3 movies I saw Adam Driver he, too, will be avoided. 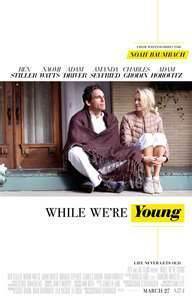 Charles Grodin tells Ben Stiller at one point that the latter’s film is, “a six and a half hour film that is seven hours too long” and that applies to “While We’re Young” which is 93 minutes and seems 7 hours too long!